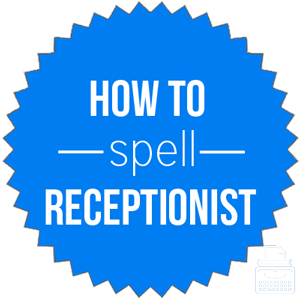 Spelling of Receptionist: Receptionist is spelled r-e-c-e-p-t-i-o-n-i-s-t. Definition of Reception: A receptionist is an employee who greets visitors, patients, and clients as they enter the a building or office. They also take incoming phone calls to the building. A receptionist works in the reception department and typically sits at a desk in the front of the building in the reception area. However, as technology advances, many companies are moving away from hiring a person to work as a receptionist and are installing automated phone and computer systems. Pronunciation of Receptionist: Receptionist is pronounced ree-sep-shun-ist. What does receptionist mean? Receptionist is a noun. A receptionist is a person employed to answer the phone and greet visitors, patients, and/or clients, typically in an office setting. Sometimes, receptionists engage in other administrative tasks, having similar duties to an office manager. I started working as a receptionist at the local police department and worked my way up and now I am the communications coordinator. The receptionist at the dentist’s office greeted us and, ironically, offered us some candy from the dish she keeps on her desk. According to Merriam-Webster’s, the word receptionist was first used in 1901. The word was formed by adding the suffix “-ist” to reception. Reception comes from the Middle English word recepcion from either Anglo-French, reception, or Latin reception-, receptio from the verb receptio. Reception is the act or an instance of receiving, as a receptionist receives or greets visitors and customers. A reception may also refer to a social gathering, typically for the purpose of formally welcoming or greeting guests. Since the word receptionist is the name of a specific job, there are very few synonyms. In the following list, the first word, secretary, is the word that is most synonymous with receptionist. The word receptionist is a noun; it is a job title. A receptionist is the employee who sits at the front desk and answers the telephone and greets guests, clients, and/or patients.